Ray Roberts, Churro Warmth, Oil on Canvas, 16" x 12"
Ray Roberts is one of California's most respected Plein Air artists. He has recently won the Gold Medal for "Best Painting" at the California Art Club and the Artists' Choice Award, the highest accolade from fellow artists, at three major Southwest art events. 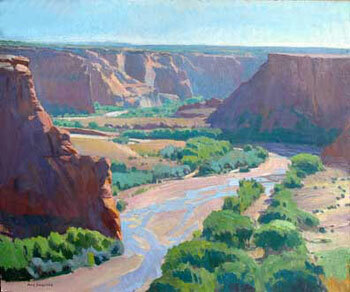 Ray Roberts is best known for his seascapes, figurative work, and majestic views of California and the Southwest. Ray Roberts' vibrant use of color, bold textures, and sensitivity to shifting patterns of light give life and movement to his paintings. They are to be experienced, not merely observed. Ray Roberts, The Hand-Trembler, Oil on Canvas, 40" x 30"
Ray Roberts, Tsegi Overlook, Oil on Canvas, 25" x 30"
Ray Roberts believes in the importance of artistic legacy. 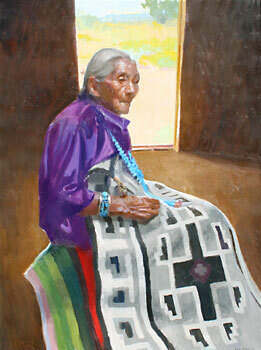 "There's a brotherhood of painters who came before me and who will come after. We speak in the past, present, and future. We talk about our experience and personality, our torments and exhilarations; we talk about the beauty of the fleeting light, time and of our family, friends and acquaintances." 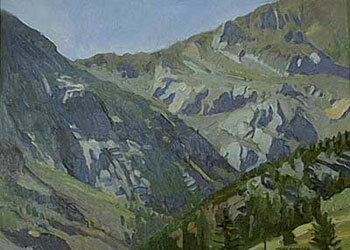 Ray Roberts, Tioga Pass, Oil on Panel, 12" x 16"
Born in 1954, Ray Roberts grew up in an Orange County with orange groves, before the days of freeways and sprawling housing developments. 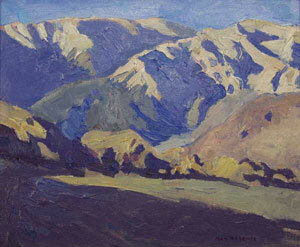 It has given him an enduring affection for the untamed, undeveloped California of his youth. One boyhood neighbor was painter Evelyn Nunn Miller, who would let Ray Roberts into her studio to retrieve the balls he'd hit over her fence. Later, after the early death of his father and mother's ill-health, Ray Roberts was sent to Orme School, a beautiful, ranch-style boarding school in the Arizona desert. Its strong fine arts program helped Ray Roberts to discover his artistic talent. 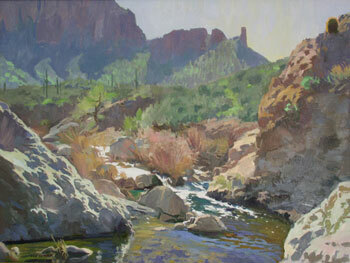 Ray Roberts, Along the Apache Trail, Oil on Canvas, 30" x 40"
He then attended the Art Center College of Design in Pasadena, California, where he studied under John Asaro. 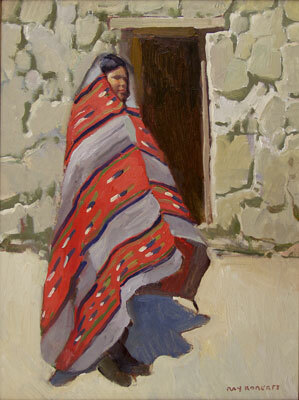 He has also studied under Dan McCaw, Len Chmiel, and Mark Daily. Art Center is where Ray Roberts also met his wife, impressionist painter Peggi Kroll. While dating, the two of them would go out nightclubbing, to sketch rather than dance! It has been a successful partnership ever since. Ray Roberts, Rassing Storm, Oil on Panel, 10" x 12"
Like many successful artists before him, Ray Roberts first pursued a career as an illustrator, establishing a studio in Los Angeles and then Scottsdale, Arizona. He got up the courage to switch to fine art in 1992 and has never looked back. Ray and Peggi now live with their three children and assorted animals on a 20 acre ranch in Angel's Camp, an old California gold rush town, surrounded by the oak-studded hills which he frequently paints. The great outdoors is Ray Roberts' studio. A bit of an adventurer, he's been known to backpack for several days into the wilderness, set up his easel on a cliff edge, or in the surf, for just the right setting. "Over the years I've become my own artist. I'm constantly searching and evolving. When I go out to paint, whether it's on the coast, the mountains or the desert, I look for something that speaks to me emotionally, and try to get that communication across. I hope that people can share my vision through the canvas. My paintings are my footprints." 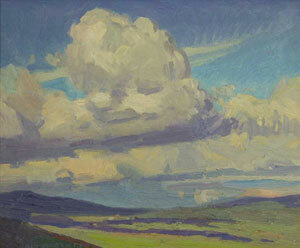 Ray Roberts, Near Lone Pine, Oil on Panel, 10" x 12"